Reminiscent of the Regency style, the Mele & Co. Trinity jewelry box offers superb storage in a rich walnut finish with burlwood accents that blends easily with nearly every décor. The interior lid features an oval mirror to help you choose just the right pieces. The top compartment has ring rolls and three open area sections to store earrings, bracelets and more. Dual necklace doors offer six hooks in all and feature catch panels to protect your delicate chains and chokers. Hand lined ginger sueded interior keeps jewelry from shifting and safeguards against scratches and abrasions. A compact platform base furnishes stability and style, while the Mele & Co. logo plate inside accents the company's brand legacy. 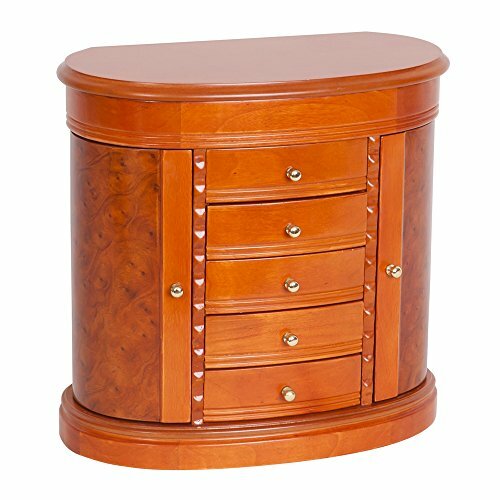 With superb storage and graceful styling, this jewelry chest makes a splendid statement and a fabulous gift. Dimensions: 13" W x 6 3/8" D x 12 1/2" H.
DUAL NECKLACE DOORS. Doors house three hooks each with catch panels to keep chains tangle free. 5 OPEN AREA DRAWERS. Open area storage gives you freedom to arrange your jewelry as you please. GOLD TONE DRAWER PULLS. Polished hardware adds formal flair and offers easy access. ARCHITECTURAL ACCENTS. Classical design elements to enhance your decor.